Part puzzle, part shooter, all PixelJunk. ixelJunk Shooter is the fourth game released for the PlayStation 3 by Q-Games, developers known for their stylish, vector-drawn graphics and unique gameplay. Each new title from the developer explores new territory, taking familiar elements from other genres and combining them into a fun, innovative experience. Shooter, as you might have guessed, is a side-view arcade shooter. Don't be fooled, however, because blowing up enemies isn't the only thing you do. It's actually more of a search-and-rescue puzzle shooter. Sometime in the distant future, humans are beginning to colonize other worlds. Resources are running low and many are on the hunt for the next big cache. An SOS signal is detected on the planet Apoxus Prime and it's up to the crew of the ERS Piñita Colada to investigate. You soon learn the population of the mining colony is trapped deep beneath the crust of the planet. You're able to explore the deep tunnels on your own or with a friend in co-op mode, though co-op is offline only and online features are limited to leaderboards. Rescue the colonists and scientists, scoop up the gems.The game is comprised of three main levels with five stages each. Each stage has a number of colonists in need of rescue, a scientist, and a handful of gemstones. The stages are split up into small sections where you have to rescue all the colonists before a door opens and you can move on. If a colonist dies, a meter in the corner starts to fill. Throughout the stage you find coins, which also appear from destroying enemies. One hundred of these will net an extra life and take one away from the dead-colonist meter. Each stage also has a number of hidden areas that usually have a gemstone inside them. A certain number of gems are needed to unlock the final stage of each level, where you will face a boss monster, then be allowed to move on to the next level. Rescuing all colonists in a stage is rewarded with a perfect bonus of one gem (awarded once per stage). The amount of enemies is very minimal for a shooter. This game is definitely not the traditional shoot-'em-up. You can either use rapid shots by tapping the trigger or hold it for homing missiles. The missiles will fill your heat gauge, which will destroy your ship when full, so be careful. Enemies more often use the element of surprise than sheer numbers or a wall of bullets to dodge. The boss fights are fun and diverse, requiring you to think rather than just spray and pray. Less is more: fewer enemies more often use the element of surprise than sheer numbers.Some light puzzle elements find a key role in Shooter's game mechanics. Water, lava, gas, ice, and magnetic black liquid are present throughout each stage. Lava will also fill your heat gauge, but water can instantly cool you off. When water touches lava, the molten rock turns to soft stone, which can be destroyed. When lava touches ice, it melts. Oftentimes you are required to use your wits to overcome obstacles and make a rescue, while your ship can be outfitted with suits to contend with elements. The Magma Suit shoots lava and the Water Suit shoots water and can grab chunks of ice and pull them down. A third suit reverses the effects water and lava each have on your ship. Shooter features a stellar soundtrack by High Frequency Bandwidth. The music complements the game well and helps keep the pacing more exciting. 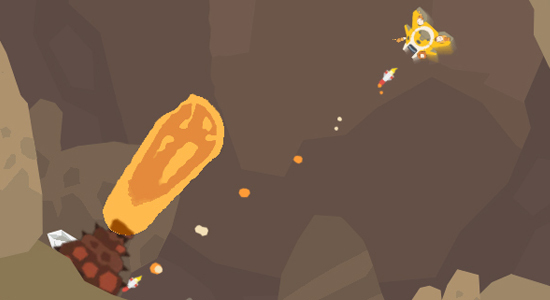 PixelJunk Shooter is a fun and challenging game. Seasoned arcade-style shooter fans might not appreciate the underwhelming amount of enemies or the puzzle mechanics, but the casual gamer and those in search of a rare gem will find it quite enjoyable. It's a solid, distinctive game worthy of the PSN download; sure to be a hit. Hmm...those must be older screenshots, they don't reflect the current version of the game, but it's only cosmetic changes to the bottom display. Edit to the above post: The mini game is through the credits you view through the game menu, not the end credits.